Once condemned by Modernism and compared to a ‘crime’ by Adolf Loos, ornament has made a spectacular return in contemporary architecture. This is typified by the works of well-known architects such as Herzog & de Meuron, Sauerbruch Hutton, Farshid Moussavi Architecture and OMA. There is no doubt that these new ornamental tendencies are inseparable from innovations in computer technology. The proliferation of developments in design software has enabled architects to experiment afresh with texture, colour, pattern and topology. Though inextricably linked with digital tools and culture, Antoine Picon argues that some significant traits in ornament persist from earlier Western architectural traditions. These he defines as the ‘subjective’ – the human interaction that ornament requires in both its production and its reception – and the political. Contrary to the message conveyed by the founding fathers of modern architecture, traditional ornament was not meant only for pleasure. It conveyed vital information about the designation of buildings as well as about the rank of their owners. As such, it participated in the expression of social values, hierarchies and order. 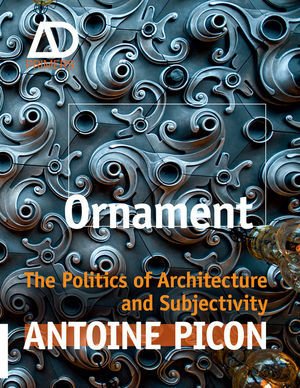 By bringing previous traditions in ornament under scrutiny, Picon makes us question the political issues at stake in today’s ornamental revival. What does it tell us about present-day culture? Why are we presently so fearful of meaning in architecture? Could it be that by steering so vehemently away from symbolism, contemporary architecture is evading any explicit contribution to collective values? Antoine Picon is the G Ware Travelstead Professor of the History of Architecture and Technology and Co-Director of Doctoral Programs at Harvard Graduate School of Design (GSD). He is also Director of Research at Ecole Nationale des Ponts et Chaussées, Paris. He has published numerous books and articles mostly dealing with the complementary histories of architecture, science and technology, among which are: French Architects and Engineers in the Age of Enlightenment (Cambridge University Press, 1992 and 2009), Claude Perrault (1613–1688) ou la curiosité d’un classique (Picard, 1988), L’Invention de l’Ingénieur Moderne, L’Ecole des Ponts et Chaussées 1747–1851 (Presses de l’Ecole Nationale des Ponts et Chaussées, 1992), La Ville Territoire des Cyborgs (L’Imprimeur, 1998), Les Saint-Simoniens: Raison, Imaginaire, et Utopie (Belin, 2002), and Digital Culture in Architecture: An Introduction for the Design Professions (Birkhäuser, 2010).